I think youâ€™ll agree with me when I say that each and every one of us has contemplated on what could have happened if things were different. Itâ€™s fun to daydream, but sometimes we daydream about stuff that are more serious and emotional than unrequited puppy love or material things. I thought about the â€œWhat Ifâ€™sâ€ a lot every since Mama Nena, my grandma, passed away. Itâ€™s been more than three years already since her death, and yet, I still do till now. Things would have been very different if my grandma was alive and well todayâ€”if she hadnâ€™t had Alzheimerâ€™s, she would have lived longer. If she was alive, she would have help my family financially with Joyceâ€™s and my Momâ€™s treatments. She would have insisted on me having a grand wedding and paid for all expenses. She would have bragged about me to all her friends and relatives for the things I have accomplished. She would have loved meeting Marc and talking to him about me as an unruly kid. She would have been there smiling proudly when I took my vows last November 25. I can think of dozens more things of what could have been, and yet, would never be. The day after my wedding, Marc, my immediate family, and my momâ€™s brothers with their spouses went to the cemetery to accompany me while I offered my bridal bouquet to Mama Nena. My sister Joyce left her bouquet for Uncle Joe (who was my favorite uncle). Aunt Bubut led us all in a short series of Hail Maryâ€™s and Glory Beâ€™s, but before we left, we took a few minutes to say our own silent prayers. I had prayed that Mama Nena and Uncle Joe have been there in spirit during my wedding, and that they saw I married a good man so they need not worry about me anymore. I thanked them for all that they have done for me. I had prayed that they rest in peace, and be happy wherever they were. It was after that I said this silent prayer I felt an unexpected closure within me. Itâ€™s difficult to explain, but for some reason I no longer felt the need to daydream of what could have been if they were alive and well today. That cloudy Sunday afternoon somehow liberated me and gave me the strength to finally move on, and begin this new and exciting chapter of my life: my life with Marc. 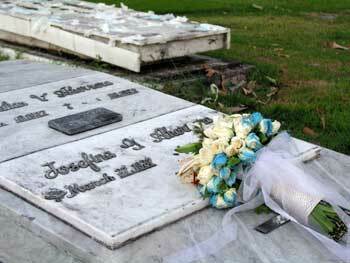 I will always remember Mama Nena and Ninong Joe. This entry was posted on Sunday, 10 December 2006 at 3:32 pm and is filed under My Family. That is a very moving story, Gail. Nangilid yung luha ko. It reminds me a lot of my great grandfather. Life is always full of growing pains. Death is one. Death makes way for the new. That new is you Gail.